Pull back your Yorkie's hair to keep it out of her eyes. Many Yorkies have weepy eyes, and those waterworks can lead to infection and hair rot if you don't keep the area around your little pal's eyes clean and dry. 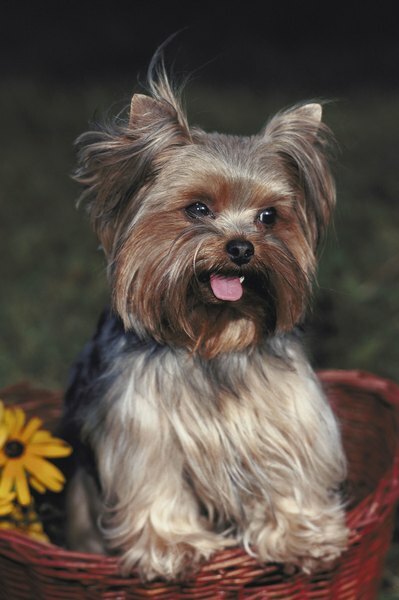 The good news: With just a minute or two of daily care, your Yorkie's hair will stay healthy. Clean the corners of your Yorkie's eyes daily. Yorkies can have teary, watery eyes even without watching a sad movie, and the excessive moisture can rot the hair around her peepers. Wipe away her tears with a soft piece of tissue, and send her on her way. Wipe away any mucus buildup around your yorkie's eyes. You wouldn't want a sticky gob of mucus in your own hair, so do your dog a favor, and clean away any eye gunk that's collecting in her fur. Gently comb it out with a flea comb, then wipe the area clean with a warm, clean, damp towel. Pull the hair back from your Yorkie's face to keep it from irritating her eyes or collecting bodily fluids. Using a tiny comb, brush the hair from the outside corner of your pal's eyes, and pull it up toward the crown of her head, between the ears. Secure it with a small rubber band or a doggy hair tie, or, if your pooch is especially fashionable, a tiny bow. Just don't pull it too tight, or it will irritate her. Take your Yorkie for regular grooming appointments to keep her hair from getting too long. While Yorkies can sport both short hair and long, flowing tresses, long hair is susceptible to damage and requires more maintenance. If you notice hair missing around your Yorkie's eyes, consult your veterinarian. This can be a sign of the hair rot caused by mucus or excess tears staying on her face.